Divine Sparks is a marvel! The film will enchant young and old. And its vibrant creativity program is already sparking the imagination and empowerment of our children, who are seeking ways to connect to the wonders of our universe. Divine Sparks Film + Book can be a one-time presentation or a multi-session course. 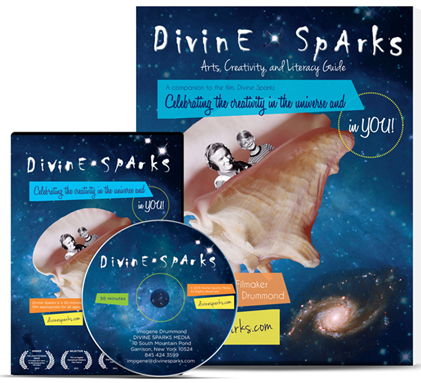 Together, Divine Sparks award-winning film and Divine Sparks Arts, Creativity & Literacy Guide create a new multimedia program that sparks self-empowering creativity. Divine Sparks program facilitates individual creativity, augments traditional curriculum, and inspires respect for oneself, others, and our universe. It can be used to build self-esteem, develop positive group dynamics, facilitate problem solving, and promote creativity as an alternative to violence. 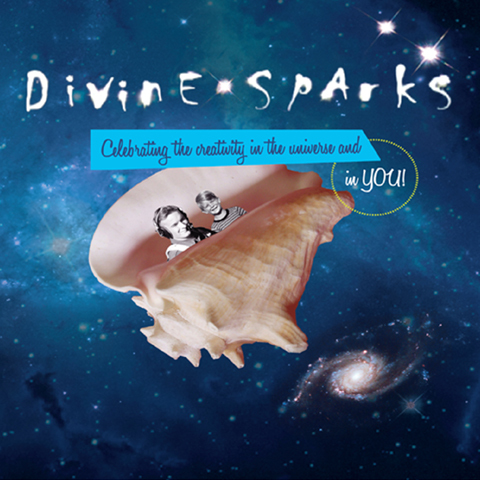 Divine Sparks film celebrates the creativity in the universe, and in everyone. The accompanying Divine Sparks Arts, Creativity & Literacy Guide is a visually lush, large format, 56-page book for parents, teachers, librarians, facilitators, and anyone interested in self-improvement and emotional health and wellness. Aimed at adults working with children ages 8 to 12, the guide can be adapted for younger and older audiences, even seniors. It can be used in diverse venues, including library, school and after-school programs; art, community, and senior centers; health and wellness settings; museums and galleries; and homes. Imogene Drummond, M.S.W., M.F.A., is an award-winning filmmaker, artist, writer, speaker, former psychotherapist, and world traveler. Imogene has presented her presentations and films, led workshops and focus groups, and participated in panel discussions and readings across the country including at museums, schools, libraries, and film festivals. These venues include at The Explorers Club, NYC; the Children’s Museum of Art, Richmond, VA; The Museum of Photographic Arts, San Diego, CA; the Birch Wathen Lenox School, NYC; The Chapin School, NYC; the Santa Monica Library, Santa Monica, CA; the Jacob Burns Media Arts Lab, Pleasantville, NY; the LA Convention Center, Anaheim, CA; The Hastings Center, Garrison, NY; Marymount College, Tarrytown, NY; Renaissance Kids, Poughkeepsie, NY; the Desmond Fish Library, Garrison, NY; the Field Library, Peekskill, NY; the ArtFull Living Designer Show House, Cold Spring, NY; the Downing Film Center, Newburgh, NY; Merritt Bookstore, Cold Spring, NY; and MICA (Maryland Institute College of Art), Baltimore, MD, among others. To schedule a presentation, please email me at imogene@divinesparks.com, or my studio assistant at info@divinesparks.com.